Super Mario Bros. 3: Can release Hot Foots to attack Mario/Luigi. Mario vs. Donkey Kong series: Can harm Mario on contact. Super Paper Mario: Can shoot fireballs at the heroes. Candles are objects in the real world that have sometimes made appearances in Mario games as enemies. In Super Mario Bros. 3, Candles are fixed to walls and are sometimes used as a hiding place for Hot Foots. Mario and Luigi can interact with candles just as with solid blocks, being able to stand on one. Candles appear in The Adventures of Super Mario Bros. 3 in the episode "Princess Toadstool for President," where one Hot Foot leaps out and chases Mario and Luigi. In Luigi's Mansion, candles are often used to light the hallways of the mansion and solve certain puzzles. Candle lamps are also one of the many sources of Fire Elemental Ghosts. If Luigi uses the Poltergust 3000 on a candle lamp, it would release a Fire Elemental Ghost which Luigi could capture to turn the Poltergust 3000 into a flamethrower. In Mario & Luigi: Superstar Saga, a candle appears in Joke's End, on the third floor. It appears useless, but if the player fills Mario with water on floor four and brings the bros. back down to the candle, they can hit Mario over the head with Luigi's hammer to cause Mario to spit water at the candle, extinguishing it. This causes a hidden ? Block to appear in the room below, which contains seven Hoo Beans. In Mario vs. Donkey Kong, candles appear as obstacles in the Spooky House. They float up and down in the same fashion as the Oil obstacle. If Mario touches one, he will burn and lose a life. However, candles can be destroyed by hitting them with a Hammer. 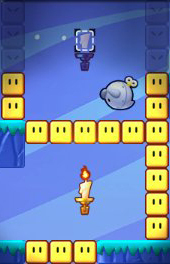 In Mario vs. Donkey Kong 2: March of the Minis, candles appear as obstacles once again, with the same attack pattern as in the previous game. If a Mini toy touches one, it will instantly be defeated. Candles fulfill a positive role in Mini Mario & Friends: amiibo Challenge, where they serve as resource items that can be picked up and placed in designated spaces. They appear in all levels that contain Boo toys. Candles emit light that forces all Boos in range to stop in place (if they were moving) and become harmless, allowing the Minis to pass through them. Their light can also enable specific blocks that resemble Rotating Blocks, making them solid. In Super Paper Mario, candle lamps appear as enemies in Merlee's Basement, when Mimi chases Mario and Princess Peach through the mansion. The candle lamps shoot fire at either hero and are invincible. There are also candles in The Underwhere and Castle Bleck that Bowser can light. In Super Smash Bros. Ultimate, candles from the Castlevania series appear in the Dracula's Castle stage in random locations. If a fighter attacks near one, it disappears and releases an item. ↑ Super Mario Bros. 3 instruction booklet. Page 24. ↑ Hodgson, David S. J., and Bryan Stratton. 2001. Luigi's Mansion Prima Official Strategy Guide. Page 7. This page was last edited on April 12, 2019, at 12:21.